Sometimes I wish I'd blogged way back when we were planning our wedding. My husband to be had dearly wanted to go to Sri Lanka, he'd done India, and he thought Sri Lanka would be a perfect place for a honeymoon. We did some looking into it, and booked with the Student Travel Agency. When we first arrived Corey and I looked at each other. Machine gun nests on bridges, regular stops for passport checks, police everywhere with guns. We got to our nice hotel and they didn't have record of our booking. We had pre paid. My husband took charge and said "give us our key we're going to sleep we'll sort this out in the morning" and off we went. It was soon sorted. Sri Lanka was a troubled place at the time. Our hotel was right on the presidential route. Stupidly we had booked 5 nights in Colombo. Every morning we sat on the verandah and had tea, as we couldn't go anywhere til the President had bedded in for work! One day a huge policeman with a big gun came over and said, "someone wants to meet you". It was the Chief of Police! He was curious as to what we were doing in Colombo! When we explained he just rolled his eyes! But we had a lovely chat over a cup of tea. After that we were treated like royalty. We then embarked on a tour of the island for ten days, and then spent a week recovering in Negombo. 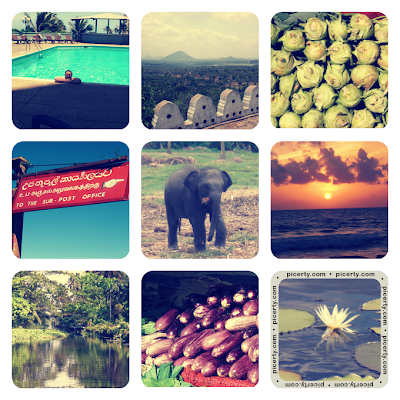 Sri Lanka taught me a lot. About injustice, about ugliness balanced with stunning beauty, about faith and how it isn't always fluffy and nice. It taught me a lot about myself, we had lots of scary times as well as fanastic ones. I can't wait to go back though, and see it in a new light!